Canadian-born and bred KARL FRIESEN (left), who appeared at three Winter Olympic Games for both West Germany and Germany, was a six-time Bundesliga All-Star and was also twice named the West German elite league’s most valueable player. It was the very first event of the XV Winter Olympics in 1988. In fact, the initial puck was dropped at the Olympic Saddledome for the Czechoslovakia – West Germany ice hockey match before the Olympic flame had been formally lit for the opening ceremonies inside McMahon Stadium. Nonetheless, the very first suprise result of the Calgary Games ensued. Czechoslovakia, winners of four silver and two Olympic bronze medals since 1948, had come to Calgary seeded third on the back on a bronze medal at the 1987 IIHF World Championships in Vienna. Two years previously, in 1985, the Czechoslovaks captured the annual IIHF title on home ice in Prague. The West Germans, on the other hand, had never beaten Czechoslovakia at the Winter Olympics having lost all six prior meetings and given up an average of eight and a half goals per game in the process. An so, JIRI HRDINA’s late first period power play goal to give Czechoslovakia a 1-0 lead came as no great shock to the crowd at the Saddledome. The supposed-neutral spectators cheered enthusiastically; no fewer than six of Czechoslovakia’s 1988 Olympic squad had been drafted by the hometown Calgary Flames of the National Hockey League. Hrdina, in fact, was slated by Czechoslovak authorities to join the NHL’s Flames immediately after the Winter Games were finished. The West Germans, however, delivered notice of intent by posting an edge in shots-on-goal for the opening period. With the quintessential Bundesliga tactic, a slapshot from the top of the faceoff circle, it was EC Koeln winger HELMUT STEIGER who leveled the score not six minutes into the second stanza for West Germany. Meanwhile, the West Germans continued to play with a physical approach and again ran up a another advantage in the period for shots-on-goal. Czechoslovakia had more of the play in the final twenty minutes but were unable to find the answer to KARL FRIESEN in the West German goal. 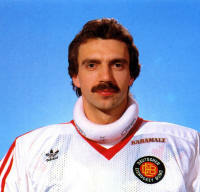 Born in Winnipeg and a product of Canadian junior hockey, the 29-year-old netminder had become a star in the Bundesliga for SB Rosenheim and the regular first-choice for the West German national team before signing with the New Jersey Devils organization in the fall of 1985. Friesen only made four appearances (7.38 avg) in the NHL for New Jersey and spent most of the year manning the nets for the Maine Mariners (35 ga, 3.48 avg, 2 so) in the American Hockey League. Friesen, who finished with 30 saves, kept Czechoslovakia off the scoreboard and set the stage for two more native Canadians to play their part in the opening act at the Calgary Games. 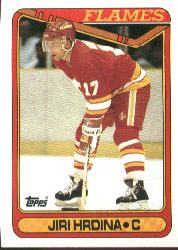 Former University of Calgary student-ahtlete and one-time Buffalo Sabres defenseman RON FISCHER initiated the decisive move. Another Canadian junior hockey product and veteran West German international, ROY ROEDGER, provided the creative pass which allowed PETER SCHILLER to easily backhand past JAROMIR SINDEL (31 saves) in the Czechoslovak cage with seven minutes left.